Launch an all out assault with the fully automatic Nerf Stampede ECS blaster. This really is the ultimate fully-automatic clip system Nerf blaster. Unleash a storm of Clip system darts from the extended 18 dart clip, and reload in a hurry with your spares. The pop-out bipod has 2 modes so you can use it as a standard bipod or a stability grip to aid accuracy. 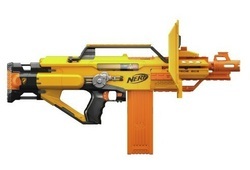 The Nerf Stampede ECS blaster also includes a blast shield. The tactical rails, strategically placed on the blaster, are compatible with most N-Strike accessories (sold separately). The pop-out bipod has 2 modes so you can use it as a standard bipod or a stability grip to aid accuracy. Includes a blast shield that attaches to the tactical rail and can be used as mobile cover for most N-Strike blasters to deflect incoming fire. Also features 3 x 18 dart extended clips, the highest capacity clip from Nerf, and 1 x 6 dart quick reload clip to get you back into the battle in super fast time. Discover more toys for younger boys at our UK top toys for boys page.